In her 33-year career, Shikha Sharma has learned that it pays to look beyond the obvious and the safe. 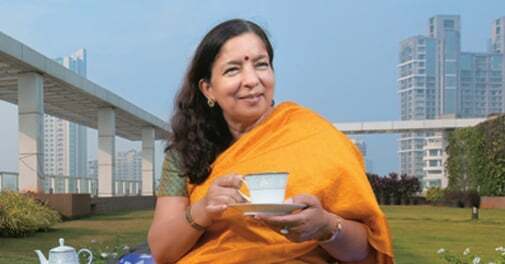 When Shikha Sharma, Managing Director and CEO of Axis Bank , walks into a room, her simplicity is immediately apparent. Her manner is most unassuming - unexpected of a top businesswoman. In her plush Mumbai office, she speaks freely about the choices and challenges in her career, but is measured and guarded about personal questions. Three things define her, she says: "I want to learn, I do not fear anything, and a lot of people have invested in me and made me who I am today." The only way to pay them back, she adds, is to invest in other people. In 2000, when private companies were allowed to enter the insurance business, she grabbed the opportunity with both hands. After nine years at insurer ICICI Prudential, she returned to banking when she joined Axis Bank in 2009. "Moving to Axis was the best opportunity of my career," she says. "It is a different experience. It is a large organisation that has different levels of complexity." Her shift from ICICI to Axis made headlines and prompted some speculation as to how things would go for her there. She had spent 29 years helping build the ICICI edifice, and Axis took her out of her comfort zone. There were murmurs about the selection process for the top job at Axis, too. But she dismisses any talk of opposition to her getting the job: "Was there a buzz on that? Well, in any case if there was, it is settled now." Sharma attributes her readiness to take risks to her upbringing. "I am happy to take risks," she says, and adds that growing up in an armed forces family teaches one to overcome fear and anxiety, and to cope with situations. At Axis, the challenge was to understand the business and get to know the top management team. "I took a couple of months to understand the banking scene and working with the team on where to take the bank," she says. "I think things worked out well." They have indeed. Since she took over, the bank has more than doubled its branch and ATM network. It has expanded in foreign markets, including Singapore and Hong Kong. Its net profit, on the basis of compound annual growth over three years, increased by 30 per cent. Axis Bank today is India's third largest private bank, after ICICI Bank and HDFC Bank. In 2010, Axis bank acquired the investment banking and broking units of Enam Securities for Rs 2,070 crore. The Enam deal brought Axis closer to being a universal bank and filled the gap in its corporate business by offering equity and M&A services. However, regulatory processes delayed the closure of the deal, and Sharma describes it as "a trying period". Axis Bank's Deputy CEO Nilesh Shah says: "Axis is now very close to being like a foreign bank and has moved a notch above a private bank." He says the bank is benefiting immensely from Sharma's experience and wisdom gathered over years in the business. Kalpana Morparia, CEO for South Asia and India operations at JP Morgan Chase, lauds Sharma's ability to create new businesses and take significant career risks in doing something that is not her forte. "Her passion to build businesses amazes me, and shows her great entrepreneurial skill and her desire to build and scale up new businesses," says Morparia, who was joint managing director at ICICI Bank and five years Sharma's senior (Morparia joined in 1975). Sharma says her biggest strength is being a good learner, and adds that she has no ego when it comes to learning from others. She is also not scared to make mistakes. "Till such time I get everything right, I'm willing to learn and I'm willing to make mistakes," she says. "I always tend to spend a couple of months understanding and learning, and frame a point of view about businesses, and then I get into execution mode." Axis is just the beginning of a new chapter in Sharma's career, which began after she landed a job in ICICI in 1980. She earned her MBA from the Indian Institute of Management Ahmedabad, with a major in finance. There she also found her life partner Sanjaya Sharma, who was her classmate. He has been working with Tata Sons for 33 years. She dodges the question of who scored better. As much as she helped shape ICICI, it helped shape her career. "I can tell you that I cut my teeth there, learnt my leadership style and everything that I know about financial services in ICICI," she says. She laid the foundation of ICICI's personal finance services business, and that was not the only start-up she helped establish. "I was part of the investment banking start-up, I was part of structured finance start-up, I was part of the retail finance start-up, and I started the life insurance business at ICICI." In ICICI, she found mentors such as K.V. Kamath, who was then Managing Director and CEO. She says that an introduction to the personal computer and a lesson in making an Excel spreadsheet are just two small examples of the things she learned from him. The opportunity to head the insurance business in 2000 was a big one. Other mentors included Narayanan Vaghul, the bank's former chairman and Mark E. Tucker, former group CEO of Prudential, who went on to become a major influence. Besides mentors, Sharma also found friends among her colleagues, such as Morparia and Renuka Ramnath, founder of Multiples Alternate Asset Management. These relationships have lasted through the decades, even after they have all moved on from ICICI. "We've now known each other for 33 years, and our relationship is way beyond being office colleagues," says Morparia. "We have a lot of common passions, and we travel together." She and Sharma travelled to Kashmir last year, along with Ramnath and another former ICICI colleague, Ramani Nirula. "It's great to have women buddies," says Morparia. "There is a handful of people Shikha can use as a sounding board, and I think I'm one of them." When Sharma decided to leave ICICI in 2009 for Axis, it was soon after she lost the top job to Chanda Kochhar. But Sharma says this was not the reason for her leaving. "Axis was a great opportunity," she says. "I know that when it comes to people, the choices are not easy and it is very difficult to explain why you choose one person over the other, especially when they are near equals." Her success in ICICI Prudential was heady. By the end of 2008, its market share was nearly 13 per cent (new business annual premium equivalent) with the next private player at 9.4 per cent. In 2008/09, the company registered a total premium income of Rs 15,356 crore, an increase of 13.2 per cent over the previous year. The new business premium income stood at Rs 6,484 crore, and the company reached a milestone of nine million policies issued since inception. This fast-paced growth had its critics, and there have been allegations about mis-selling of ULIP (unitlinked insurance plan) products. Sharma defends her company against these charges, saying some are warranted but others are not. "I think there were too many regulatory changes that were happening too fast, and that slowed down the insurance sector," she says. Ramnath, who was deputy general manager at ICICI Ltd in the early 1990s and reported to Sharma, recalls that their 22-year-old relationship was turbulent in the beginning but later settled down. The two are now almost as close as sisters, she says, adding: "When Shikha visits my home, we even chat sitting on the floor. She is such an unassuming person, she is ready to eat with me in the kitchen rather than in the dining room." Ramnath says Sharma was an exceptionally demanding boss. She recalls an incident from her initial years. "On a crazy workday, I finalised a term sheet and wound up work at two in the morning, and left it with a handwritten covering note on Shikha's table," she says. "The next day, when I turned up in the office, I got a drubbing from her. She pulled me up for the note not being typed and said it was highly unprofessional." Far from ruining the relationship, the incident strengthened it. "We became a formidable team after that and covered for each other, as Shikha was good at corporate strategy and planning, and I was good with clients," says Ramnath. But friendships are firmly compartmentalised, because Sharma says she believes a CEO's position is very lonely. "I've enjoyed being a CEO and have enjoyed getting the opportunity to shape something as it grows," she says. "I think that is the fascinating part of it, but it is a lonely responsibility, as ultimately every decision ends with you, and you just cannot blame it on anyone else." This belief perhaps shaped her leadership style, as she is of the opinion that consensus is for larger routine issues. However, on bigger issues, where decision making is crucial, she says, one needs to listen to oneself. She says she has often overlooked the majority view and come out triumphant. "You should do things that you believe in," she says. "There has to be a fine balance between listening to people and taking decisions." A hands-on boss is a hands-off mom. Her children - a son and a daughter - "love her this way", she says. But she does want to lead by example in her personal life, too. So when she wanted her children to learn music, she enrolled for singing lessons too. "My son picked up playing the guitar quite well," she says. Behind the hard-nosed businesswoman faÃ§ade, her friends say, Sharma is a fun-loving person. Morparia says she loves shopping and has a great collection of exquisite Indian weaves. By her own admission, Sharma enjoys Bollywood movies and tries to catch them on opening weekends. Unlike many CEOs, Sharma likes lazy mornings. "These days, I'm into swimming, so I catch a swim in the morning," she says, adding that she is in office till at least eight in the evening. She was a good student, and good with numbers. This has helped her in professional life. "I did very well in application of mathematics courses," she says. "I'm good at using data for decision making and at reading data patterns." She says she scored better than most of the engineers in her MBA class. And was she better with numbers than her husband? Again she deflects the question. "I have learnt a lot from him" is all she is willing to say. Her colleagues say she has come into her own after joining Axis Bank. She seems to agree, as she signs off the interview with Business Today. "At this point in time, I do not think that there is any leadership skill that I need to work upon. It is now more an issue of allocating my time to different issues."